How would a Modern Metra Electric work for you? The Metra Electric could take advantage of Ventra cards and the Ventra app to offer lower fares and transfers with CTA and Pace. Today, Metra Electric fares follow the fare zones used by other Metra service, so they are higher than a CTA fare for similar distance. For instance, a ride from Hyde Park or a South Chicago branch station costs $4.25, 70% higher than a CTA train fare. A ride from Pullman (111th St.), within the City of Chicago, costs $5.50, or 220% higher than a CTA fare. Monthly passes are also more expensive than CTA passes. The Metra Electric should be integrated with Ventra cards and the app, and should use fares that are equivalent to CTA fares for travel within the City of Chicago. The fare should include a low-cost transfer to CTA trains or buses, or Pace buses. Preliminary results from a study of mobility in South Cook County suggest that lowering fares on the Metra Electric (and nearby Rock Island line) to match CTA fares within the City of Chicago--and offering transfers to CTA and Pace--would increase Metra ridership by 33%. The Metra Electric is a world-class, high-capacity elevated rail corridor that connects downtown Chicago to the South Side’s top destinations. It was designed to offer frequent service, and it once did: trains used to serve the South Chicago branch every 10 minutes, for instance. ​Frequent trains are the key to convenient and usable service, and lack of frequency is what limits the Metra Electric's success today. Trains come as infrequently as once an hour on the Main Line south of 63rd St. and the South Chicago branch. 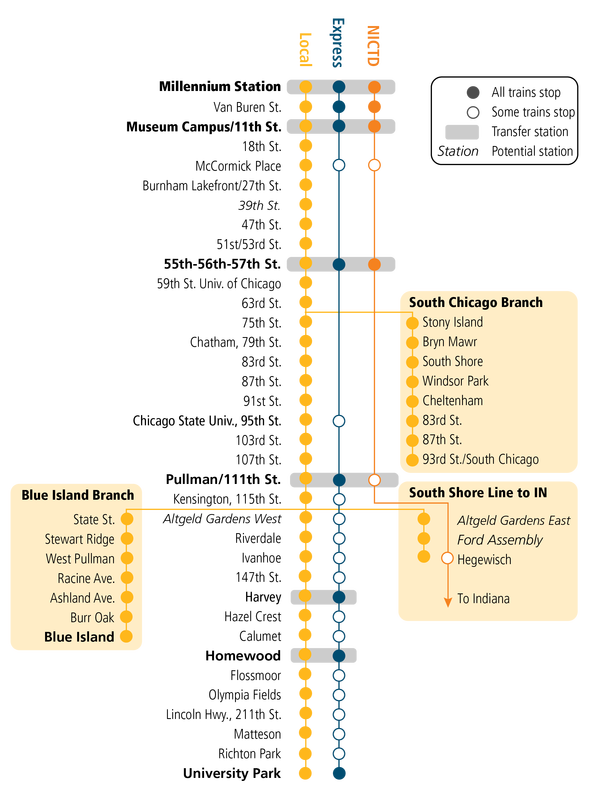 The Blue Island Branch only sees a train once every two-hours mid-day. Running trains every 10 or 15 minutes would make the Metra Electric just as usable and convenient as CTA rail lines that serve other parts of Chicago. Metra Electric's many tracks allow for a combination of both local and express trains. In addition to local trains that come frequently and make all stops, Metra should continue to operate occasional express trains that offer faster service to destinations farther down the line. Major stations like 55th-56th-57th Street and Pullman/111th Street would be places to connect between local and express trains, and could even serve Amtrak trains from around the Midwest and the country. The Metra Electric already connects to many CTA and Pace bus routes. Running trains more frequently would allow trains to replace some express buses that CTA and Pace operate today. These buses and resources could be re-deployed to offer more frequent service on neighborhood bus routes that connect to the Metra Electric. These buses should be scheduled to create fast connections with trains. Many Metra Electric stations don't feel safe because they are in a poor state of repair or have inadequate lighting. Although Metra has recently worked to improve many stations, more needs to be done to improve lighting, signage and access to stations. Cook County has some of the best employers in the country, but workers are often unable to reach these jobs reliably or in a reasonable amount of time. For Southland neighborhoods that struggle with high unemployment, access to transportation means access to opportunity. Connecting the Metra Electric to the north and west sides via CrossRail Chicago would create affordable and convenient connections to the region's biggest employment centers downtown and near O'Hare Airport.